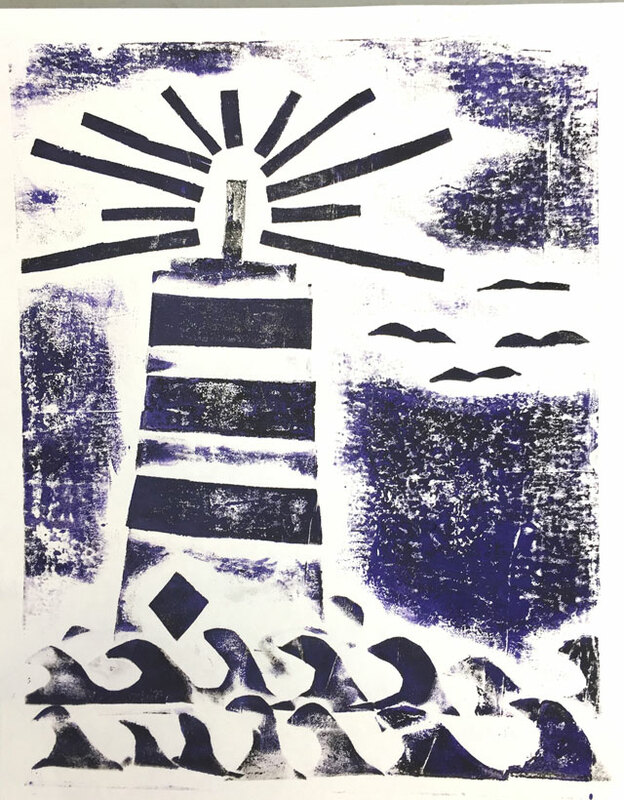 Lighthouse Collagraph Printmaking Project - Small Hand Big Art - Charlotte N.C.
North Carolina coastal lighthouses were the inspiration in this amazing lighthouse collagraph printmaking project in our 9-12 yr. old class last week! One of the first things I did when I moved from Seattle to “the South” was take a road trip down the coast of North Carolina, all the way down to Savannah, GA and then back up again. We acclimated to the warm summer days (a full 30 degrees warmer than the Pacific Northwest!!) at various stops along the Outer Banks and made it a point to see every single lighthouse in the area (and climb up the inside of as many as we could!). Lighthouses really resonate with kids who live in this area. At the mention of a lighthouse they all seem to be struck with fond memories of family trips to the beach. 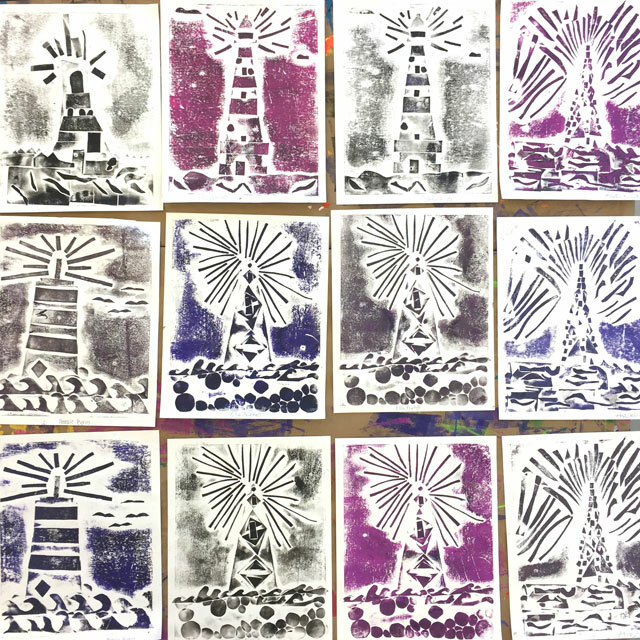 So when we tee’d up the inspiration for this really cool lighthouse collagraph printmaking project, they all seemed super excited to dive right in! 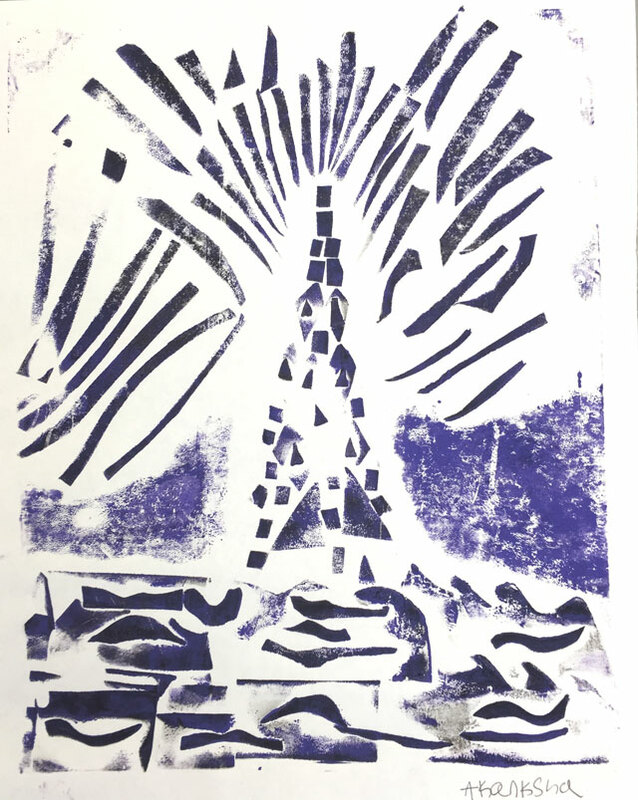 A collagraph print is just simply the process of creating a printing plate by building up the surface with shapes and objects. A favorite process is to cut a used manilla folder in half, and use one half for the printing plate, and the other half gets cut up into pieces and glued on with a glue stick. For this particular project, we used peel and stick foam sheets – and OMG it was life changing. I seriously don’t think we will ever go back to a glue stick again. Ever. It was so much easier for the kids to cut, peel and stick their shapes, and something about the colors of the foam helped them in their composition. 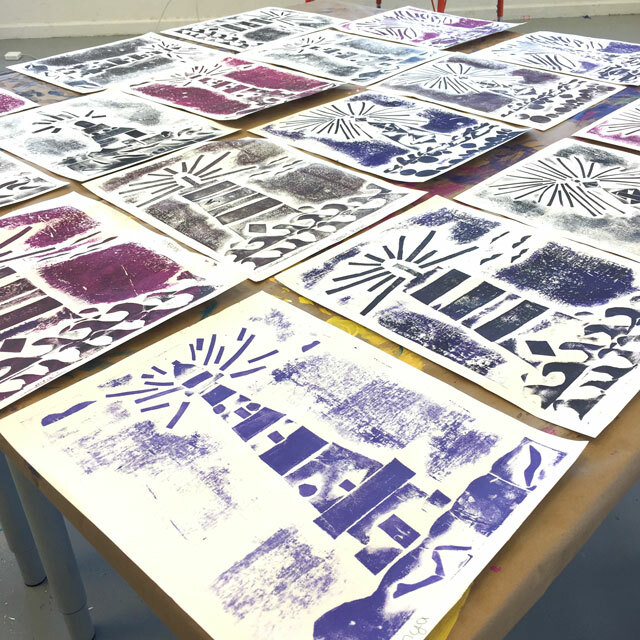 Although when we heard students asking for someone to pass them the purple, we had to remind them that it didn’t matter what color their foam was – these are just the printing plates, and they were about to get covered with printmaking ink! Part of the challenge in creating a beautiful collagraph print is to layer, layer, layer. And then layer some more. We strive for at least two layers, ideally three, gradually getting more and more detailed as they build up their layers. Students were instructed to build their composition from back to front (the background to the foreground), and to compose it almost as if creating a sculpture. So for example, if their lighthouse was going to sit on a rocky island of stone, they had to create the stones first before situating their lighthouse on top of it. If waves were going to be in the foreground of their lighthouse, or splashing on top of their lighthouse, they needed to add the waves after their lighthouse, and so on. This project took two one hour class periods. With our traditional tagboard and glue stick method, we would have spent a lot of time running around ensuring that all the edges were glued down so they could be sturdy enough to withstand pulling at least two prints without all the little pieces falling off. With the peel and stick foam, the sticky back is so strong, we almost had the opposite problem – you better be super careful where you put it because once it is stuck down you can’t change your mind! So the second week was spent on the printing process. 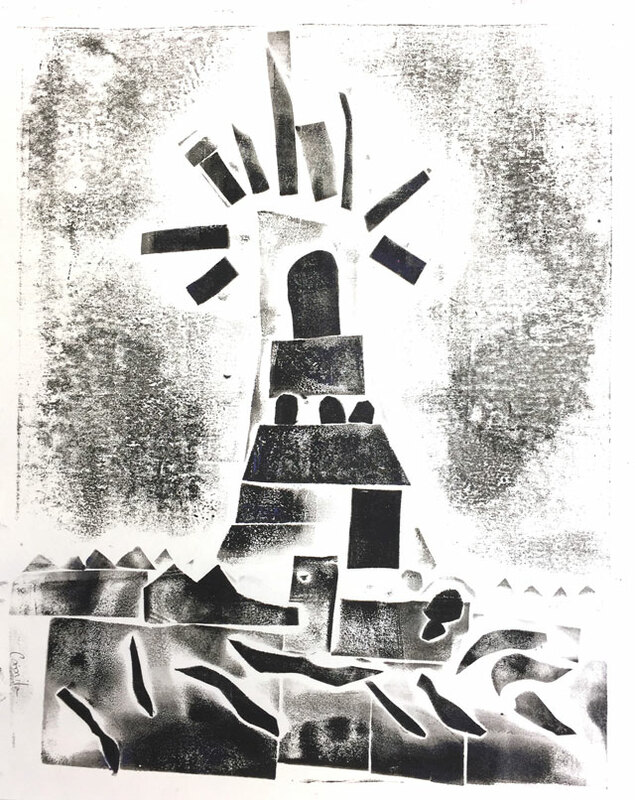 We used water-soluble block print ink, rolled onto their printing plate with a hard rubber brayer. People sometimes ask us if we use acrylic for printmaking and the answer is no. 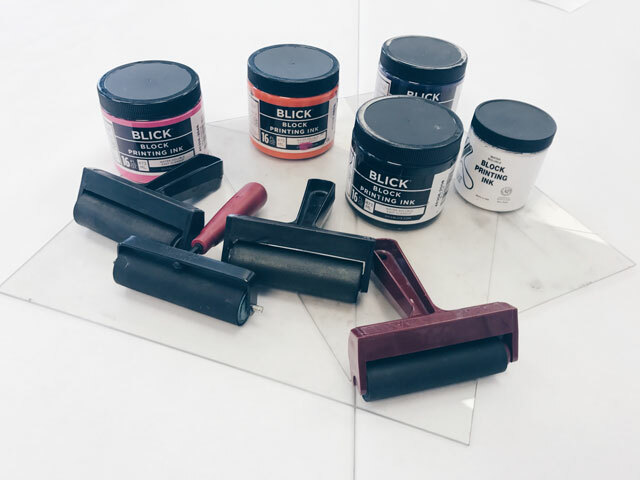 We only use block print ink for printmaking because it has a very thick and gooey consistency that results in very even, opaque prints (when even pressure is applied). Acrylics are very hit and miss. They are hard to apply evenly to the plates, usually dry and flake in between prints, and the prints are washed out. Just our two cents. When we do printmaking projects we also love to teach students how to properly sign and number their prints so they can have an appreciation when they see prints at art galleries or in museums. 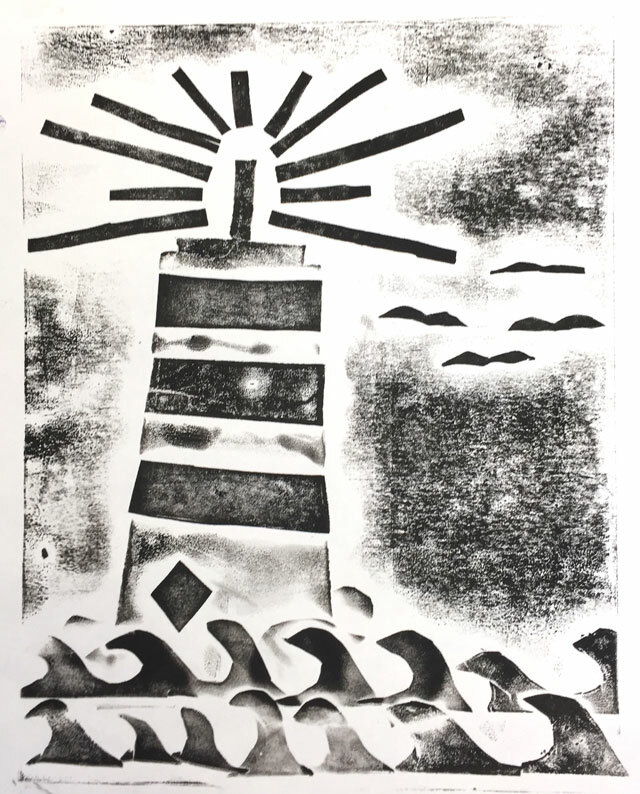 The prints from this lighthouse collagraph printmaking project came out lovely! We were quite proud of them! Here’s a to another favorite collagraph printmaking project! 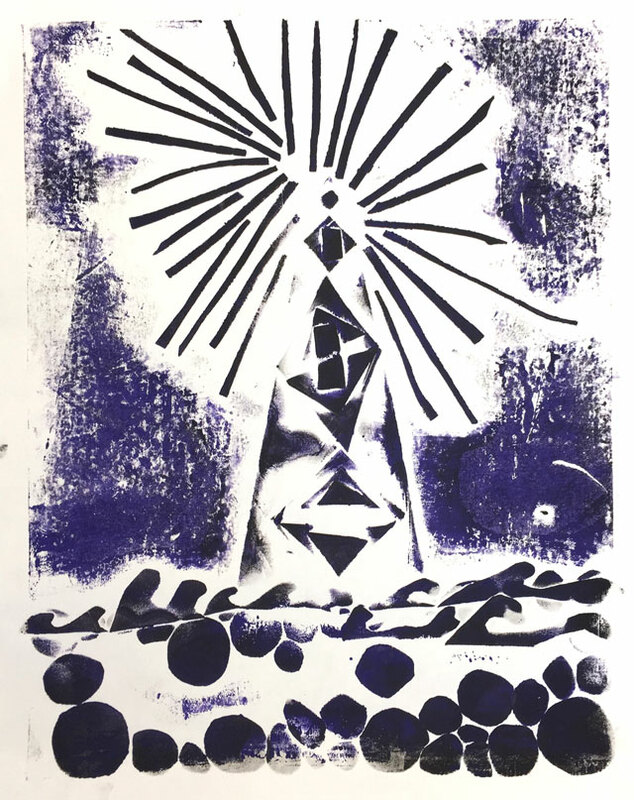 Oh -and this kaleidoscope project from a teen camp last summer where we didn’t even get any shots of the prints but made something so beautiful out of the printing plates themselves! 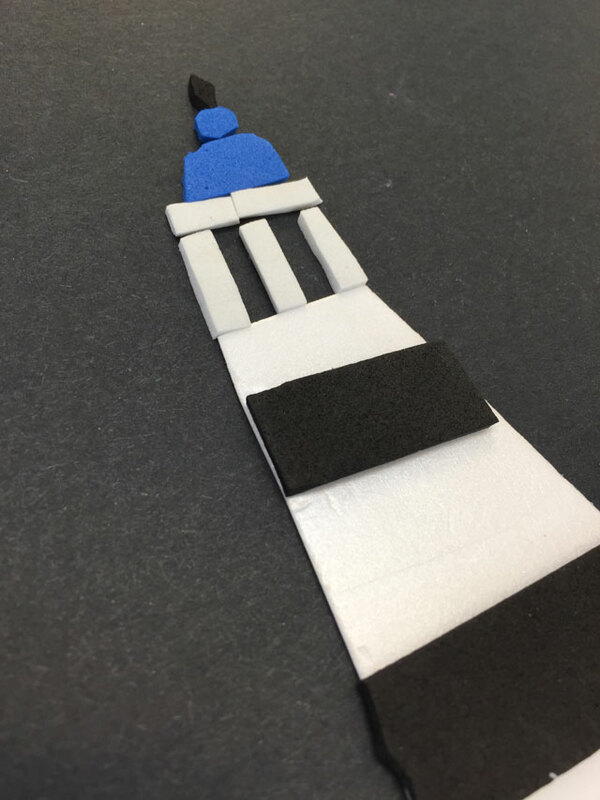 What background do you place the foam pieces onto for this project? Do you use a folder or cardboard? Also, did you show kids light houses and what were some of the discussion q’s for that. Hi Lily – we use a heavyweight cardstock or poster board. In our experience if the printing plate is too rigid (like cardboard or mat board) it’s harder to get a good print – it helps if it has a little flexibility so that you can press in the grooves, etc. 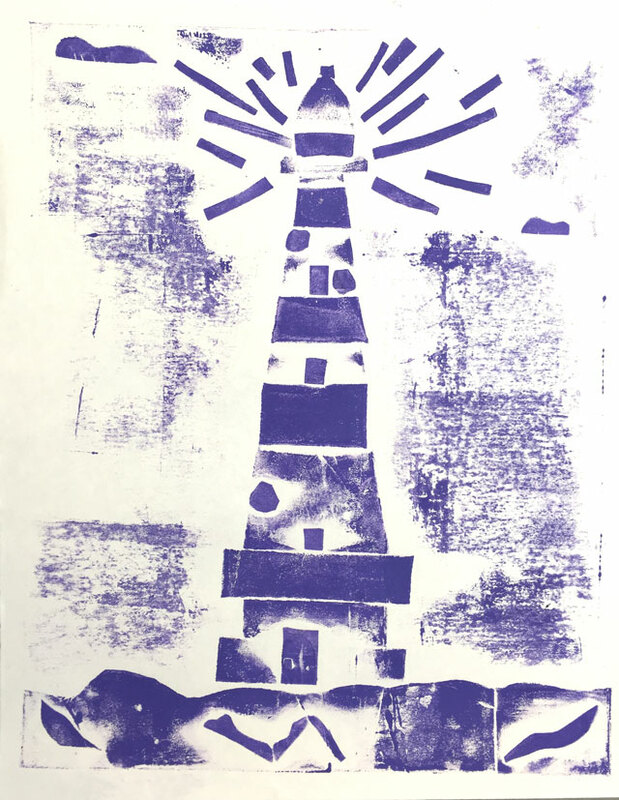 And yes, we have a lot of well recognized lighthouses in North Carolina, so we show them photos of those and talk about the shape, structure, etc. Did you run these thru any kind of press, or just burnish them individually? Hi Gwen – thanks! No press – just a little arm muscle and a hand-held burnisher. We have the kids roll the ink then what we typically do with a collagraph is lay the paper on top of the plate, and tell them to rub it and then get their little fingers in all the grooves. (you’d think it would wrinkle the paper w/ the print but it’s usually fine!) After they rub it we go back over it just to make sure they were pressing hard enough (it’s very much a hands on with us – we have them all working on another project as we call them back 2 at a time to make their prints). Then we let them lift the paper to reveal the results! Using a lighter weight paper and laying it on top seems to pull a better print for us vs. flipping the thick plate over and pressing from the back onto the paper. Perhaps not the traditional method but it works for us! Hi! Is the purpose of layering the foam in 2-3 layers with the details being the “last layer” so that there is white space between the various layers which distinguishes the various features of the print?